Just starting your project management career? View this resume for an assistant IT project manager to learn how to create a strong value statement. Just starting your project management career? To be a successful candidate for IT jobs, resume expert Kim Isaacs says it helps to have a comprehensive resume. To learn how you can create a strong value statement on your own resume, check out this sample resume for an assistant IT project manager that Isaacs created below. 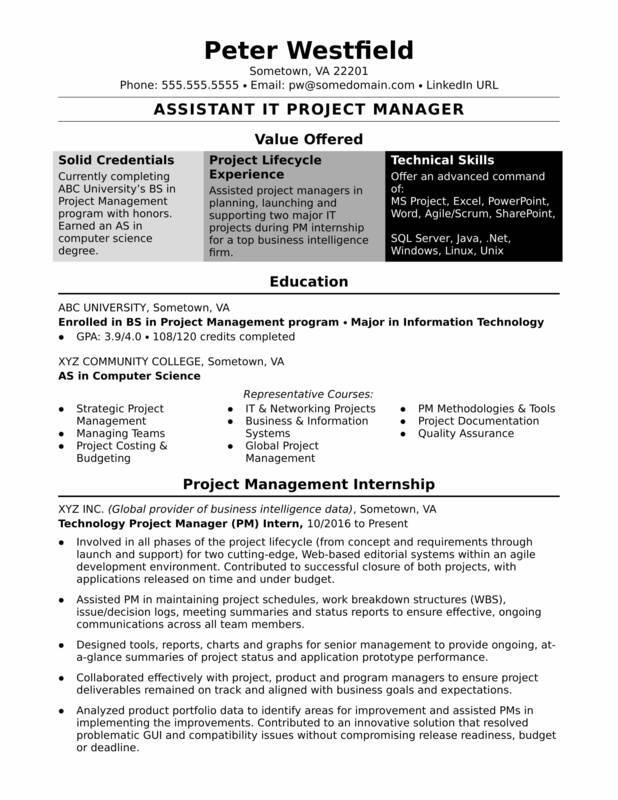 You can also download the Assistant IT Project Manager resume template in Word. And if you need more help, get a free resume evaluation from the experts at Monster's Resume Writing Service. Jobs in technology are projected to grow 13% (or 557,100 jobs) from 2016 to 2026, according to the Bureau of Labor Statistics. Working in tech, you can expect to make a median annual salary of $84,580 per year. Additionally, you can learn more about project management careers and IT careers, and search for IT project manager jobs on Monster. Honors graduate of ABC University's BS in Project Management program. Also earned an AS in computer science degree. Assisted project managers in planning, launching and supporting two major IT projects during 12-month PM internship for a top business intelligence firm. Involved in all phases of the project lifecycle (from concept and requirements through launch and support) for two cutting-edge, Web-based editorial systems within an agile development environment. Contributed to successful closure of both projects, with applications released on time and under budget. Assisted PM in maintaining project schedules, work breakdown structures (WBS), issue/decision logs, meeting summaries and status reports to ensure effective, ongoing communications across all team members. Designed tools, reports, charts and graphs for senior management to provide ongoing, at-a-glance summaries of project status and application prototype performance. Collaborated effectively with project, product and program managers to ensure project deliverables remained on track and aligned with business goals and expectations. Analyzed product portfolio data to identify areas for improvement and assisted PMs in implementing the improvements. Contributed to an innovative solution that resolved problematic GUI and compatibility issues without compromising release readiness, budget or deadline. Employed as a computer lab assistant at ABC University for two semesters; clerk at XYZ Retail Company for one year (seasonal); and computer and math tutor throughout college.